Life sciences and biotechnology are widely regarded as one of the most promising frontier technologies for the coming decades. Life sciences and biotechnology are enabling technologies – like information technology, they may be applied for a wide range of purpose for private and public benefits. On the basis of scientific breakthroughs in recent years, the explosion in the knowledge on living systems is set to deliver a continuous stream of new applications. There is a huge need in global healthcare for novel and innovative approaches to meet the needs of an ageing populations and poor countries. There are still no know cures for half of the world’s diseases, and even existing cures such as antibiotics are becoming less effective due to resistance to treatments. Stem cell research and xenotransplantation offer the prospect of replacement tissues and organs to treat degenerative diseases and injury resulting from strokes, Alzheimer’s and Parkinson’s diseases, burns and spinal – cord injuries. In the agro-food area, biotechnology has the potential to deliver improved food quality and environmental benefits through agronomically improved crops. Food and feed quality may be linked to disease prevention and reduced health risks. Foods with enhanced qualities (’functional foods’) are likely to become increasingly important as part of lifestyle and nutritional benefits. Considerable reductions in pesticide use have been recorded in crops with modified resistance. Life sciences and biotechnology are likely to be one of the important tools in fighting hunger and malnutrition and feeding an increasing human population on the currently cultivated land area, with reduced environmental impact. Biotechnology also has the potential to improve non-food uses of crops as sources of industrial feedstocks or new materials such as biodegradable plastics. Plant – based materials can provide both molecular building blocks and more complex molecules for the manufacturing, energy and pharmaceutical industries. Under the appropriate economic and fiscal conditions, biomass could contribute to alternative energy with both liquid and solid biofuels such as biodiesel and bioethanol as well as to processes such as bio-desulphurisation. Plant genomics also contributes to conventional improvements through the use of marker – assisted breeding. New ways to protect and improve the environment are offered by biotechnology including bioremediation of polluted air, soil, water and waste as well as development of cleaner industrial products and processes, for example based on use of enzymes (biocatalysis). The first number of the journal has been published in 1996 in Romanian language. 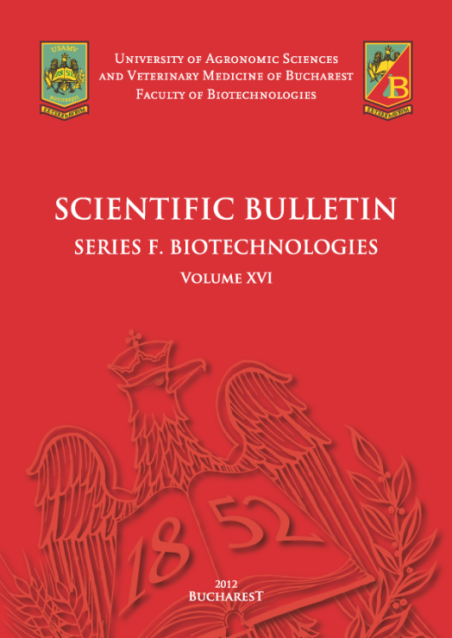 From 2006 Scientific Bulletin "Biotechnologies" - Series F has been published annually in printed version in English language. In 2011 the journal has got an electronic ISSN and is also published on-line. The journal contains research papers in the field of biotechnology (industrial biotechnology, agricultural biotechnology, animal biotechnology). The journal also has published the Proceedings of the International Symposium of Biotechnology SimpBTH (from 2008 to 2011) organized by the Faculty of Biotechnology from Bucharest and by the Centre of Microbial Biotechnology Biotehgen. The journal has been indexed in CABI (www.cabi.org) database from 2007. This is an Open Access Journal (the users have the right to read, download, copy, distribute, print, search, or link to the full texts of these articles).